The Nintendo Switch is billed as the be-all and end-all of consoles. And it certainly realizes the dream of playing great games on your big screen television and switching to mobile play in the car, on the bus or in the middle of the park. But this flexibility of playing at home or on the go comes with one not-so-small problem: How do you keep it charged in all of these situations? It's easy enough to charge the Switch while at home. Any time the console is connected to the dock, the Switch is charging. The best way to ensure that it is properly charging is to verify that the Switch's display can be seen on the TV, so if you are docking after playing in portable mode, double check that it shows up on the TV before the leaving the room. You can tell exactly how much power the Switch has by the battery icon in the top-left of the screen. On a full charge, the Switch can give you about three hours of gaming. How much specifically will depend on the exact game, but Legend of Zelda: Breath of The Wild, Nintendo's flagship game, hits this three hour battery life expectancy pretty much dead on. How long will you need to charge? If you have the Switch plugged into the dock, it takes about as long to charge as it does for the battery to drain. This translates to about two-and-a-half hours of charge time to get to 100% battery life. It's the Joy-Cons that may give you the real problem. They each have about 20 hours of battery life, which may seem ideal, but if one of them goes dead during a play session, you will be left with a slight dilemma. The Nintendo Switch doesn't come with a way to remotely charge the Joy-Cons, so you will need to plug the Joy-Cons into the side of the Switch for a recharge. The good news is that the Switch itself doesn't need to be docked for the Joy-Cons to charge, so you can simply use it in portable mode. But what if your Switch is low on power? Thus the dilemma. If you don't want your play session interrupted, you may want to invest in the Joy-Con Charging Grip. This accessory is similar to the grip that turns your Joy-Cons into a single controller with one major difference: You can use a USB cable to charge the Joy-Cons while you play. When charging through USB, make sure you are using a USB-C cable. Not only is USB-C more efficient, older cables could potentially harm the Nintendo Switch. If you are playing a normal game by yourself, charging the switch is fairly straight forward. Simply plug in a USB-C cable to the USB port on the bottom of the Switch and keep playing. 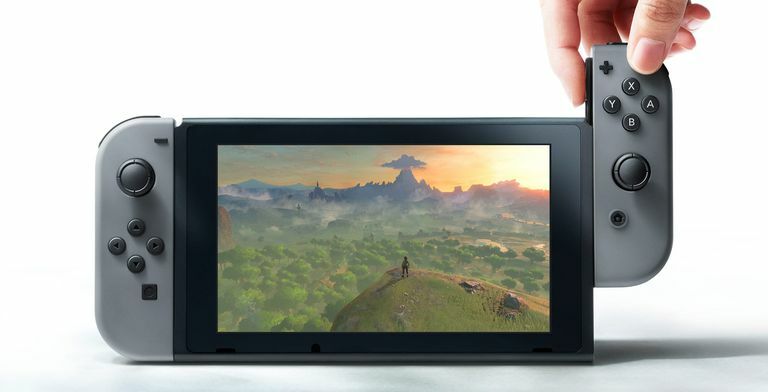 If your Joy-Cons are attached to the side of the Switch, you should be fine. But what if you are playing a game like Just Dance 2017 or multiplayer Mario Kart 8? Here's where things get very interesting. If you are using the stand on the back of the Switch and have your Switch on a solid surface like... you know... a table... the USB port on the bottom of the Nintendo Switch is going to be a little hard to use. Why did Nintendo build it that way? They couldn't put the port on the sides where the Joy-Cons go, so they either had to go with the top or the bottom. The top would be odd for charging while using it as a handheld, so they went with the bottom. How do you get around this annoyance? The easiest way is to grab a few books to place around the Switch so that you can lift the main unit up and create a cavity of space for the cable. But this is definitely odd, so look for third-party accessory manufacturers to offer some solutions in the (hopefully near) future. If you've seen a commercial with a group of friends gathered around the Nintendo Switch in the middle of a park or on a basketball court, you may have wondered what they would do once that 2-3 hours of battery life has run out. The simple solution: portable power. You can actually charge your Nintendo Switch by plugging it into your laptop. This will definitely take longer than a wall outlet, but if you just need to extend your game time or want to charge while on a trip, it will do. However, you will need to power down your Nintendo Switch for this to work. When powered on, the Switch tends to charge the laptop instead of the other way around. But if you are serious about gaming on the go, you can always invest in a battery pack. In a world surrounded by so many mobile devices, these are easy enough to find, but the key here is to find one that uses USB-C. This is the newest standard for USB ports, and because the Nintendo Switch uses USB-C, you will get the most bang from your buck from a battery pack that also uses it. Currently, the Anker PowerCore+ 20100 Portable Charger and the Jackery Titan are among the few battery packs that support the Nintendo Switch. The best part of the Nintendo Switch is the fact that it is both a portable gaming console and a home gaming console. The games play fantastic in portable mode, but there's no doubt they are at their best when seen on a big screen TV. So what do you do if your Joy-Cons run out of battery while at home? Normally, you would need to switch to portable mode, but this means you won't get the advantage of playing on the big screen. Alternatively, you can spend around $30 on a Joy-Con charging grip. This accessory is the same as the grip that comes with the Switch with one major difference: You can charge your Joy-Cons while you play. You'll need to plug the Joy-Con charging grip into your console with a USB-C cable to accomplish this, but so long as you have a long enough cord, this isn't a stiff price to pay. Use the Joy-Cons in detached mode. If your Joy-Cons are plugged into the sides of your Switch, the battery will drain much faster. Turn off Wi-Fi and Near Field Communications (NFC). Go the Settings -> Airplane Mode and turn Airplane Mode on. Bluetooth, Wi-Fi and NFC will be turned off. You will need to turn Bluetooth back on to use the Joy-Cons in wireless mode. Turn down the screen's brightness. Go the Settings -> Screen Brightness to adjust the brightness of the display. You can leave Auto-Brightness on. Simply move the slider to the left to dial back the brightness. Still having problems charging your Switch? Find out how to troubleshoot the Nintendo Switch to see if you can solve the problem yourself.